I’ve briefly mentioned I fell in love with a new budgeting software, but it’s about time I told you the full story. I had heard about YNAB a while back through Words of Williams, one of my favorite personal finances blogs. $60 seemed like too high of a price to pay for something that I could do for free with just a piece of paper and an envelope. YNAB offers a free 34 day trial, and I decided there was no better time than the present to try it out. After one day, I knew I’d be buying the software. 1) Give every dollar a job. 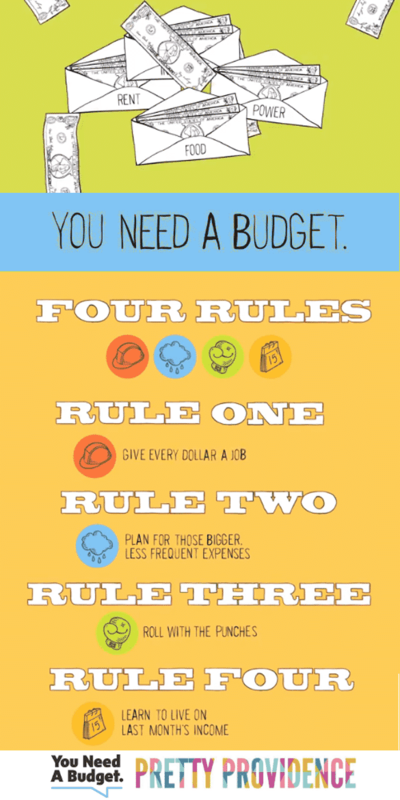 2) Plan for those bigger, less frequent expenses. 3) Roll with the punches. But how do you accomplish Rule 4? Simple! Make a budget category called “Buffer.” When you finally have enough money for a full month’s bills, you just pull it out of the budget (by putting a minus sign in front of the amount.) Tah-dah! YNAB is easy to use with the envelope budget as well. You just create a Cash account (to go along with your checking) and record the purchases like normal. No more recording purchases with scraps of paper or saving every single receipt! YNAB has cool reports you can run, like tracking your spending by category or calculating your net worth. One of the things I love the most is when I record a car payment, I can literally watch my car loan dwindle. For all of my college student friends, YNAB is free for college students. If you’ve already graduated (like me), don’t despair!